According to archeological evidence, humans may have inhabited Dataw Island as early as 10,000 years ago. Most artifacts, however, point to the Native Americans who occupied the island from 1,500 BC to 1,000 AD. Both pottery shards and shell middens – or large, ancient piles of oyster shells arranged in mounds or rings – have been discovered on the sea island. The middens support a specialized plant community that arises only at the site of such remnants. The first European settler to take up residency here was a Scotsman named Caleb Westbrook; in 1682 when he received the island as a grant from the Lords Proprietors. The land became know as Westbrook Island, and Westbrook established a successful deer skin trading post here. His time on the island was brief, however; Westbrook was killed by a Savannah Indian on the island in 1693. As Westbook had no heirs, the Lords Proprietors reclaimed the land and granted it to Charles Odingsell in 1698. By 1702, Odingsell had forfeited his claim and the land was granted to Joseph Boone. The first documented variety of the current name, Datha, was recorded on this title. 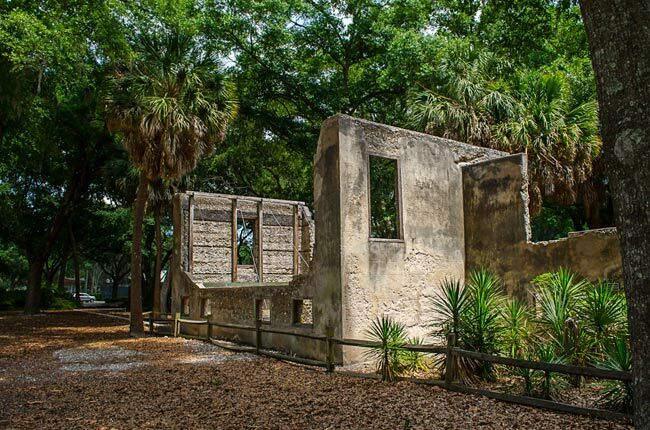 In 1783 Wadmalaw Island planter William Sams bought the island from Sarah Gibbes – who also was a cousin – and moved here after leaving his home near Charleston. 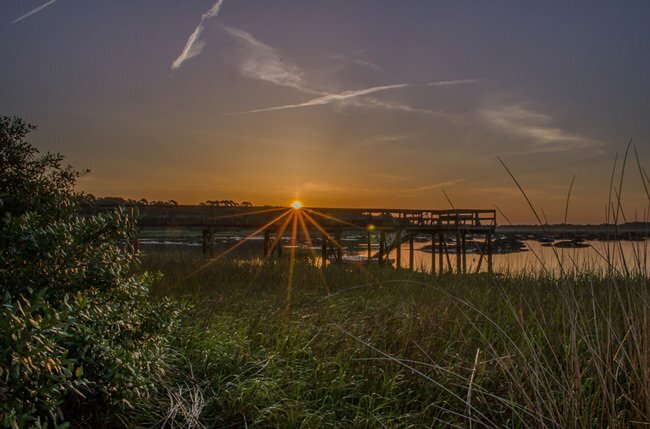 Charleston fell to the British in 1780 during the Revolutionary War, and many people fled the war-torn city and its surrounding areas in the following years. 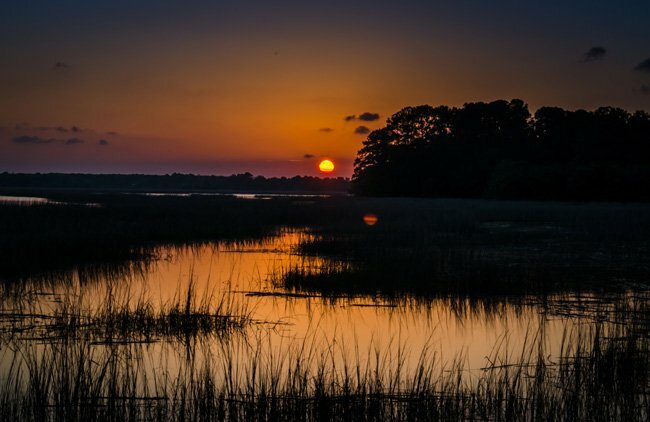 Sams established a prosperous Sea Island cotton plantation on his refuge of Dataw Island. 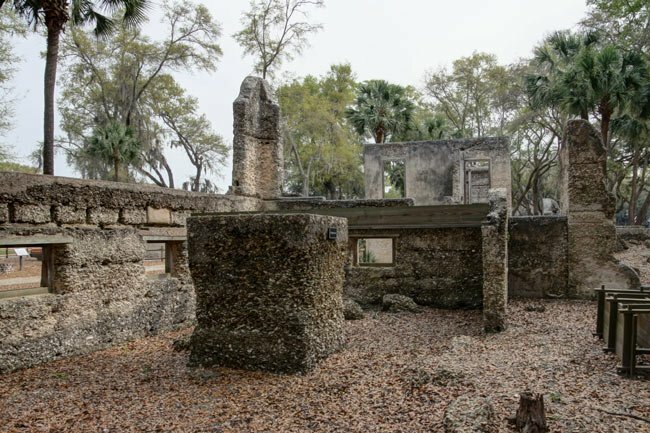 The tabby ruins of what is called the Sams House remain on the island and are preserved by the Dataw Historic Foundation. Photos of the Sams House can be seen in the above and below photos. The section of ruins known as the middle house – as opposed to the two wings added later by Sams’ son Berners Barnwell Sams – are thought to have been built in the 1760s or 1770s. It is believed by archaeologists that William Sams’ predecessor on the island, Lewis Reeve, built the house prior to Sams’ arrival. Sams’ son added the wings after inheriting the home island and part of the island – his brother inherited the rest of the island – in 1808. The island remained in the hands of the Sams family until the Civil War. In November of 1861 Union troops occupied the sea islands of South Carolina and Georgia, including Dataw Island. Most land owners evacuated, leaving their plantations abandoned. The government seized these properties and sold them in tax sales. Such was the case with Dataw Island, which was confiscated in 1863 by the Federal government. New Yorker William Irwin bought the island and subdivided it, and the former slaves of the Sams cotton plantation remained as tenant workers. The land changed hands over the subsequent years. Another New Yorker, businesswoman Kate Gleason, purchased the island in 1928. When she died in 1933, she left the property to her close friend, Elizabeth Rowland, and her husband, Richard. In 1983 descendants of the Rowlands sold Dataw Island to the residential development branch of aluminum manufacturer, Alcoa. 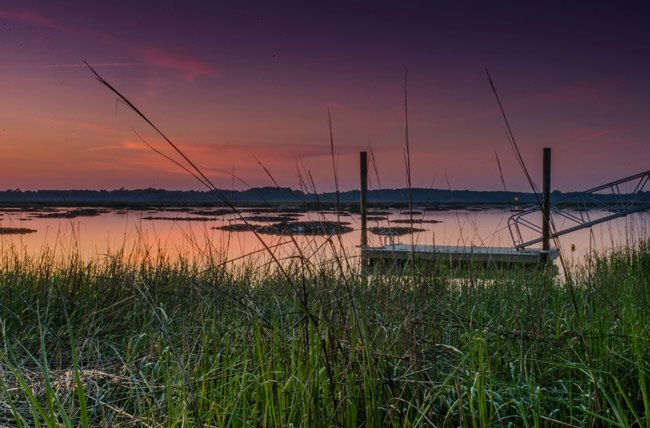 Today the island is a private residential community, and in 1997 homeowners formed the Dataw Historic Foundation to protect the island’s cultural and natural history. 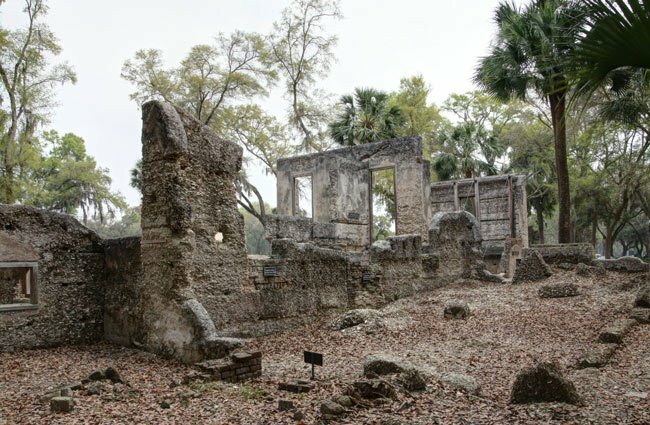 The Sams Plantation Complex Tabby Ruins is archaeologically and architecturally significant. The site, possibly built upon and occupied well before 1783, encompasses approximately ten acres on which the ruins and/or archaeological remains of at least twelve tabby structures have been identified. 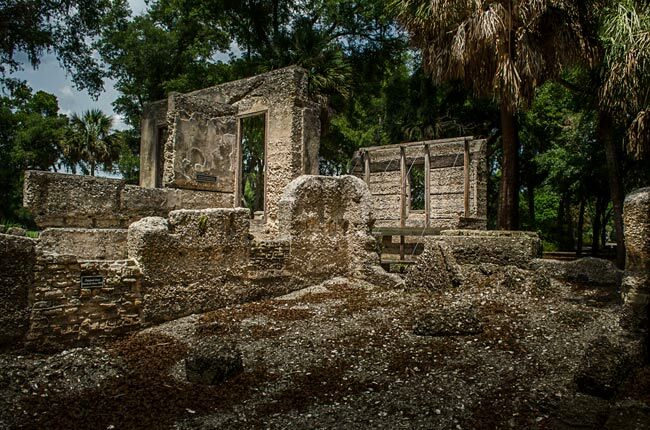 Tabby structure ruins include the main plantation house, a rectangular enclosure comprised of tabby walls, a large tabby kitchen, and five tabby slave quarters. Immediately outside this enclosure were a variety of tabby dependencies including a barn/stable, a smokehouse or blade house, a well/dairy house, and a well. The smokehouse in entirely intact and retains the only pitched tabby roof known to exist anywhere in the United States. Northwest of these structures was the Sams family cemetery and Episcopal chapel enclosed by high tabby walls. Two other structures, possibly an overseer’s house and a granary/mill were located to the southeast of the plantation house. Southwest of the main house was a tabby cotton house. 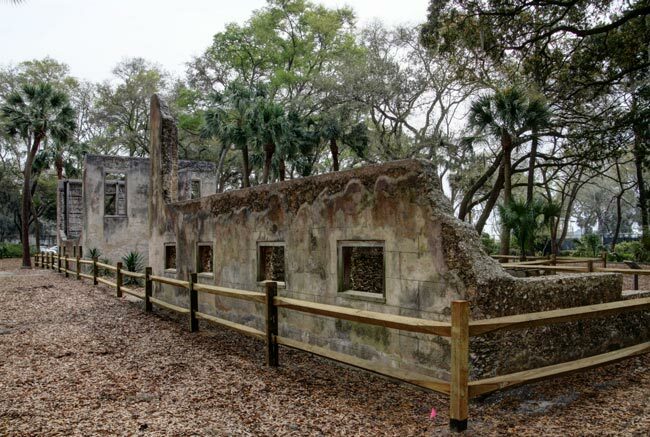 Historic documentation indicates additional buildings within close proximity including main barns, a slave street, fowl houses, and a pigeonnier. Berners Barnwell Sams and Lewis Reeve Sams acquired the plantation from their father William in the early 1800s. The Sams grew indigo, cotton, and oranges. This important and unique orange crop was shipped by schooner to Charleston for distribution to northern markets. The slave labor force necessary for these plantation operations numbered in the hundreds. During and subsequent to the Civil War the Sams Tabby Complex was occupied by freedman. Following the Civil War the plantation house was destroyed by hurricanes. Hi, Jamie. Hopefully, the map at the bottom of the page will help. Good luck!